It isn’t a secret that in the world we live in seems we are more concerned by our body appearance more than our immune function. We are troubled by either shifting or decreasing than maintaining our body mass, we are worried by the risk of age related diseases such as cardiovascular, osteoporosis, cancer and neurodegenerative disorders and general frailty in our later years. Social media encourages us to seek for the #gymbody, the #lookgoodfeelgood factor, which is not entirely possible. Of course, there are measures we can take such as cosmetic surgery, anti-ageing measures in the form of bioidentical hormone replacement, cocktails of vitamins, antioxidants, anti-inflammatory compounds and aesthetics, however, the point is, not everyone can afford or is favourable to these treatments. The question raised here at the top in bold here warrants a brief explanation, and before reading on, the answer is yes – there is a quick treat anti-ageing treatment, which helps us feel and look good without anticipating needles prodding and pricking. Most importantly, we should remember that the ageing process is simply characterised by the declining functional capacity, increasing vulnerability to disease, debility, and unfortunately, death. I would like to think, we all aim to live longer, try to reverse our ageing process and fight against all of these traits. We know that as we get old, some of us have a higher risk to disease than others and frailty is a consequence of natural ageing. Clinically, beyond the obvious signs and symptoms, we want to analyse the biomarkers of cellular ageing, inflammation and age associated immune deficiencies at tissue and cellular level, to identify these deficits. Keeping these markers optimum, at least within normality there are things we can try to do without contemplating blood draws or swallowing a pill. Surprisingly, it is what we have all heard before. Exercise (both resistance and aerobic) in combination with adequate protein and energy intake. As we age it is natural that we lose muscle mass. Moreover, during chronic illness our body wastes plus muscle mass is wasted and weakened. Lean muscle mass has been reported to decrease at approximately 1% per year after 30 years of age and observed at the end of the fifth decade. In layman’s terms, we have to replace what we are losing and gain muscle to slow down this process. Yes, it is the cheapest, safest and most reliable route to anti-ageing. I'll highlight the word protein purposefully as it deserves clarification. Studies in anti-ageing have shown that adequate protein intake, particularly, leucine-enriched balanced amino acids and possibly creatine enhancing muscle strength. Some studies have even recommended the amount protein ingested should be spread equally throughout the day, i.e, equivalent amounts at breakfast, lunch, and dinner. Also, if additional protein supplementation is given it should be administered between meals. Levels of protein intake as high as 1.6 g of protein/kg/day have been demonstrated to increase exercise-induced muscle hypertrophy in older persons. Without getting deeper into the protein debate which will be up for discussion in future blogs, the equation is so far simple. A dose of aerobic exercise + increased protein intake + resistance/strength exercises to increase muscle mass = (- ageing + feel good/look good). This series has been a long time coming as my time gets limited and other interests drive my focus elsewhere but TRT is still one of the things I most enjoy doing. The idea of this blog is to give a more medically based opinion on the 3 commonest injectables used in the UK; my experience with it and my patients’ experience with it including labs. Firstly, I’d like to touch upon the fact that this blog is not referring to testosterone cycles- what you normally see in forums- that focus more on body building. 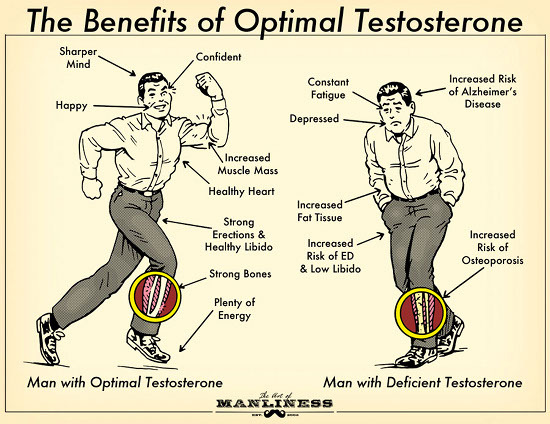 The focus is on sub-optimal testosterone levels being brought back up to optimal levels. Comes in ampoule only. If you are getting it online in a vial, its not from a UK pharmacy. Claims to be sustained release- hence called susta-non due to having 4 different esters (or carrier molecules). Each ester releases the testosterone at a different time and hence you get a more staggered release pattern where the peaks and troughs are more stable. Single 1ml shot lasts 2.5 to 3 weeks. It can be given in divided doses. Main disadvantage- carrier oil is peanut oil and benzyl alcohol. This is becoming a problem I’m seeing more and more of as its giving rise to side effects which I don’t get with other injectables. Most people with mild intolerances generally don’t even know they cannot handle peanut oil. When given in such large doses (1ml into the muscle), it can cause pain and local inflammation that lasts much longer than expected. As part of my practice is gut dysbiosis where I see a lot of food intolerances, I recognised this very early on. If this is your experience too, try changing to the other injectables or use creams. The average response I get when I ask about peanuts is that my patients love it! Do keep an open mind about intolerances- just because you love it does not mean that you can handle it. Look out for other symptoms of intolerances like joint pains, rashes, headaches, flu-like symptoms etc. You may get none, or all of them. This is the most similar to Cypionate that many people read about in forums. Cypionate is available in the US and some other countries but not in the UK. Its what I would put my patients on who need continuity of care from the US. Its quite a bit more expensive that sustanon- stupidly more in fact. I don’t know why! Comes in ampoule only. If you are getting it online in a vial, its not from a UK pharmacy. The ones in vials are considerably cheaper- according to google and from what some of my patients tell me- but we practitioners will never advocate it. Its just not worth it to me. Is given in the same way as Sustanon- either single shot that last 2-3 weeks or in divided doses. Carrier oil here is castor oil which is less allergenic (apparently) and benzyl benzoate. I personally have never had a complaint with this so suspect that it probably is less allergenic. If the price point of this and sustanon were the same, I would prefer using this. This can hurt but its usually due to the volume of product injected into a small area. I occasionally inject it either in both buttock cheeks especially in very slim patients, or change directions still with the same entry point to spread things out a little. This comes in a vial. Carrier oil here is refined castor oil which is less allergenic (apparently) and benzyl benzoate. I’m not a huge fan of Nebido but it has its place. I personally prefer it for patients who have completed their family (for potential fertility implications), travel a lot, have compliance issues or similar reasons. This always suppresses your pituitary hormones which means that the negative feedback generated will block your own production of testosterone. On a practical level, a lot of people don’t mind it and are happy to put up with some testicular shrinkage- as long as everything is being monitored regularly. Others freak out a little when their pituitary levels of LH comes back as close to nonexistent. They can either opt for a different option or start on a HCG protocol (Human Chorionic Gonadotropin) to stimulate their own production of testosterone alongside testosterone. Its a protocol used a lot in the US and quite many of my American patients request the same continuity of care as it works well for them. There are also a small number who really feel the peak- not in a good way. Optimal levels of testosterone usually makes you calmer and less anxious but too much or too little can give rise to similar symptoms paradoxically when it comes to moods and aggression. Bioidentical topical creams from Compounding Pharmacies- I use these a lot and my patients love them (mostly). They are much easier to use compared to the gels available on the NHS (messy, too large a volume and sometimes does not give the blood picture expected which may point to user inconsistency in application). My topicals come in 3 forms- creams, gels or liposomal gel. I have so far only ever ordered the liposomal gel as its absorbability is far superior at no extra cost. As these are bespoke, there is a period of trial and error until you find the right dose after which, we simply make the cream in said dose for each patient. Its more physiological with everyday application and so mimics the body’s own production more closely. This also translate into less pituitary suppression. Disadvantage- some people perceive creams to be less effective (not true). Some don’t like having to apply a cream everyday. Transdermal Implants- not a commonly available option and I do not have much experience in it for testosterone. This is something I’m hoping to explore as I believe that there is a place for it seeing as it has a 4-5 month life cycle. My experience in implants is in contraceptive implants which I did not like. Similar to Nebido, my personal feeling is that in order to achieve such longevity, it needs to be quite powerful which can give rise to side effects initially. However, do watch this space as I’m hoping to explore this further and may find myself changing my mind about it. I hope that this article will help you gain an idea of what is available legally via a pharmacy in this country and to be able to tell the difference between what may or may not suit you. Or why you may be reacting to something others don’t have a problem with. As with most things medical, its not quite that simple but getting the right balance is possible and certainly achievable.